It is widely accepted in scientific circles that a little bit of chocolate every day does wonders for one’s general health, demeanor, muscular strength, bone density, complexion and sexual performance*. Researchers have found that the substance can be taken in either liquid or solid form, hot or cold, in secret or with others of the same inclination**. There is anecdotal evidence that sitting in one’s comfiest armchair and closing one’s eyes while taking this medication improves it’s efficacy, however further studies are required in this particular field***. One point on which all scientists are in agreement is that the darker the chocolate the better****. Here at the Therapeutic Chocolate Society, we strive to improve ease of administration of this highly efficacious therapy. We strongly support consumption of chocolate in its solid form, pure and unmodified. However if a liquid form improves ease of administration, and if the slightest hint of fragrant orange and warming cinnamon, with the subtlest of bites of fiesty cardamom improves the appeal of the treatment, we may have just the thing for you. Warm a cup of milk of your choice, hot enough to melt the chocolate but not so hot that it scalds your mouth. Stir gently with the chocolate spoon until all melted. 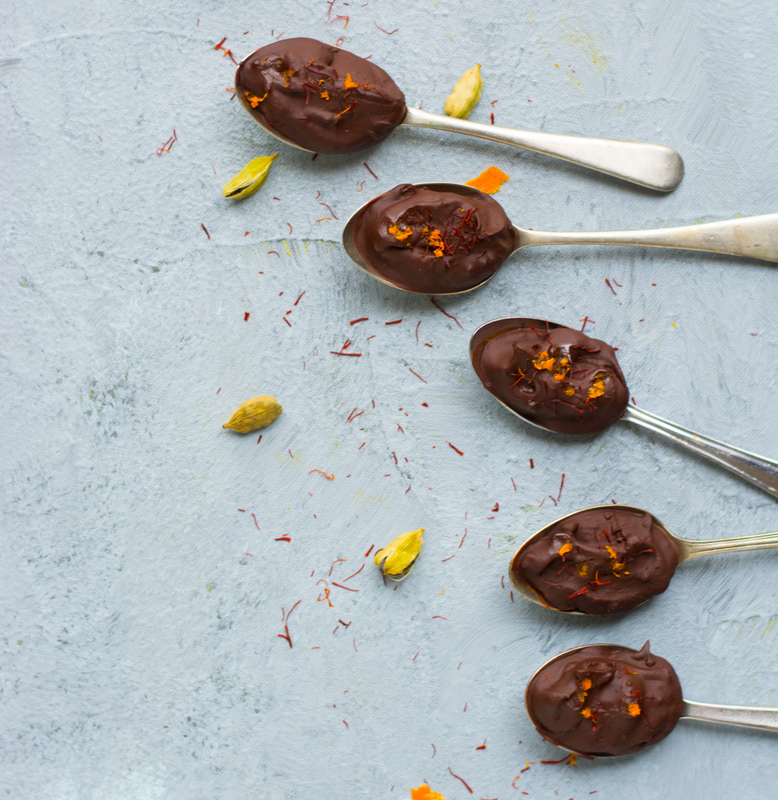 Lick any residual chocolate off the spoon (it is important to consume the full dose). Add a little sugar or sweetener if desired and sip until all gone. You may feel a rich, creamy sensation coating the inside of your mouth. You will experience a heat in your chest as the warm liquid trickles from your mouth to your stomach. 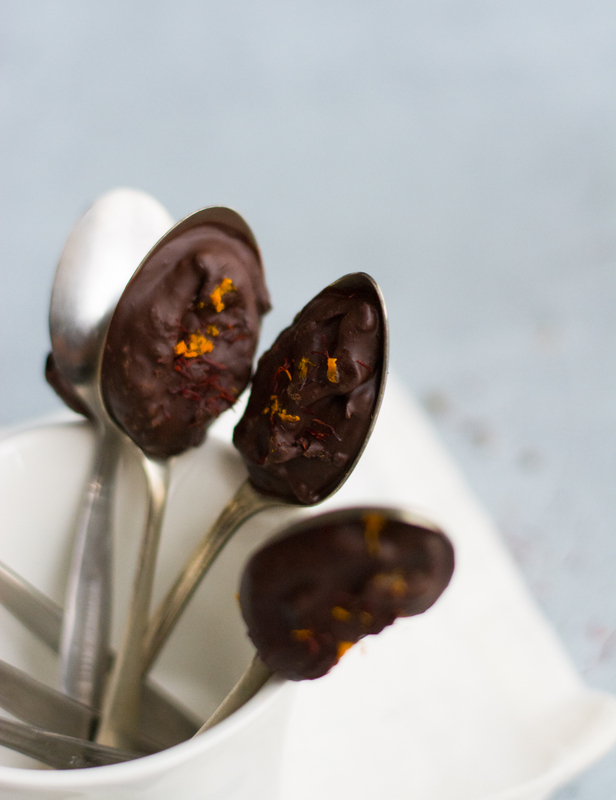 Approximately 100% of patients report a heady cocoa aroma that overtakes the remaining senses, a sprinkling of orange and spices lacing it’s edges. All of these are normal and frequently reported side effects of hot chocolate made with Spiced Orange Chocolate Spoons. Like life itself, it is a bittersweet experience of depth, complexity and ultimately, sweetness. *This is likely completely fabricated. ***There are no such studies being conducted, nor are there ever likely to be. ****This part may actually hold some truth. Lay out 12-14 teaspoons in a tray. Alternatively you can use an ice cube tray. 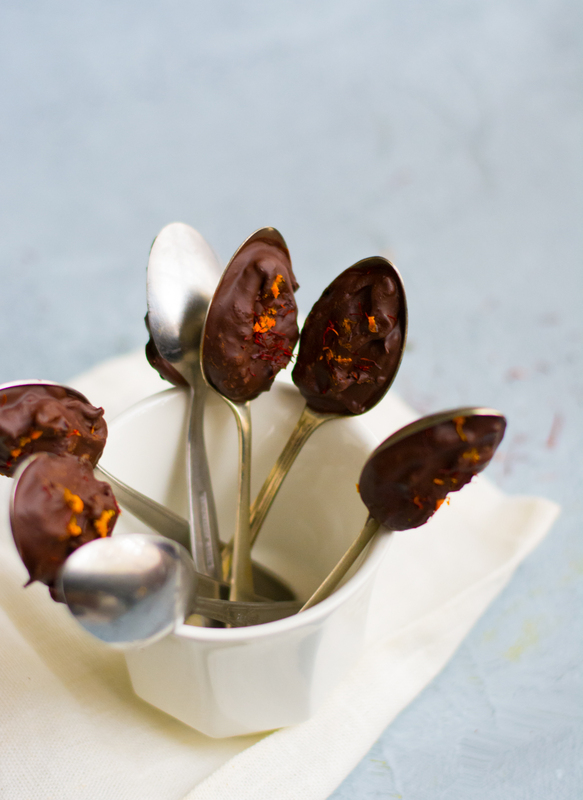 Melt the chocolate in a double boiler or in the microwave in 20-30 second bursts. Add the other ingredients. Stir to mix well and place small amounts (about 1 1/2 tsp) of the mixture into the teaspoons or the sections of the ice cube tray. If using the ice cube tray, insert wooden popsicle sticks into the centre of each cube of chocolate. Place in the fridge to set or in the freezer if there is a medical emergency requiring immediate chocolate treatment. Stir into a cup of hot milk, sweeten if needed find an armchair and enjoy. Like things extra chocolatey? Use two! How does one join the Therapeutic Chocolate Society? I would like a lifetime membership please. Ok, so I was litterally about to write these exact words…. then I realised Linda already said it! LOVE this. Can’t wait to try, although I will probably lick the spoons before they ever reach hot milk. BTW – how do you think it would taste with heated coconut milk? And in other news, saw something about a worldwide chocolate shortage looming on the horizon. Seems we are all consuming faster than it can be grown. As for coconut milk- I think it would work even better as the creaminess and slight sweetness of coco milk would be divine with this. Oh yum, if I made these, I wouldn’t have to will power to stick around and photograph them! Gorgeous!! 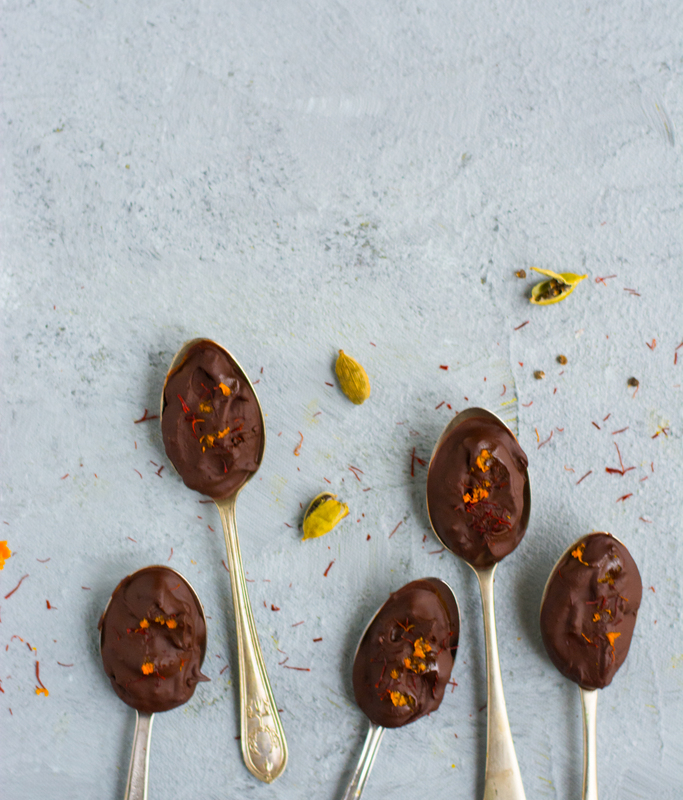 these chocolate spoons are such a great idea!